The 2018 Formula DRIFT championship swapped the tight Streets of Long Beach for round two at Orlando Speed World this weekend. And the drama began early with an incident in practice that saw Chelsea DeNofa (USA) hit the wall in his BC Racing / Nitto Tire Ford Performance Mustang RTR. He was avoiding an accident on the track but was unable to avoid the wall. Following frantic work by his team, DeNofa made it to qualifying and scored 87 points on his first run. However, he was unable to complete his second run after the team discovered a more serious mechanical issue and withdrew the car. With his competitive weekend over, Chelsea joined the Formula DRIFT / AEM Halftime Show with Maximum Driftcast as a co-host and was able to give his personal perspective on the track and the unfolding action. For the drivers who remained, it was a very tight qualifying session. The top drivers were separated by a couple of points as each had to perform at their very best to gain an advantage in the heats. An interesting pattern emerged in qualifying that was established by Piotr Wiecek (Poland), who won the final round of the 2017 season and qualified first for the 2018 opener. That round would subsequently be won by Fredric Aasbo (Norway), who qualified first for Orlando. Aasbo’s results, both on the Streets of Long Beach and his Orlando qualifying performance, are particularly impressive because he’s driving the brand new Rockstar Energy Drink / Nexen Tire Toyota Corolla. And despite his 2015 Champion status, few people expected him to emerge so strong. A typically modest driver suggested the new car had similarities to his previous mount, but that doesn’t fully explain the achievement. Aasbo’s qualifying position gained him a bye in the Top 32 run offs, meaning his first competitive drive would be against Matt Vankirk (USA) in his Driftmatic Nissan 240SX. Aasbo would get the judge’s decision and advance to meet Ken Gushi (Japan) in his GPP / Toyota Racing Falken 86, who had to beat Daijiro Yoshihara (Japan) in his Turn 14 Distribution / Falken Tire Subaru BRZ in the previous round. Aasbo’s progress would be halted in the Final Four, when he came up against eventual winner, Chris Forsberg (USA) in his NOS Energy Drink Nissan 370Z on Nexen Tires. However, Fredric wasn’t going down without a fight. The first two runs were too close to call for the judges and the crowd called for “One More Time.” On the second attempt, Forsberg was able to claim victory and head to the final, leaving Aasbo in third by virtue of his qualifying position. Forsberg had to fight hard to reach the final, first vanquishing Vaughn Gittin Jr (USA) in his Monster Energy / Nitto Tire Ford Mustang RTR in the Top 32. That put him against Jhonnattan Castro (Dominican Republic) in his GPP / Toyota Racing Falken 86 in the next round, before meeting the on-form Piotr Wiecek in his Worthouse / Falken Tire / Nissan Silvia S15. Wiecek had qualified first on the Streets of Long Beach and took third place on the podium. He’d also scored a double win at the non-championship Motegi Super DRIFT Challenge the following weekend during the Grand Prix of Long Beach. Yet despite his momentum, Wiecek succumbed to Forsberg, who headed to the final against Wiecek’s teammate and 2017 FD Champion, James Deane (Ireland). To reach the final, Deane qualified in second place in his Worthouse / Falken Tire / Nissan Silvia S15, scoring an impressive 97 points to challenge Aasbo for top honors. He also got a bye run in the Top 32 and would beat Forrest Wang (USA) in his Vapetasia / Achilles Radial / NRG Innovations Nissan S15 in the Top 16. The Top 8 saw Aurimas “Odi” Bakchis (Lithuania) swept aside in his Falken Tires / Maxxoil / Drifz Wheels Nissan S14. Deane’s Quarter Final was against Ryan Tuerck (USA) in the Ryan Tuerck Racing / Gumout / Black Magic / Nexen Tire Toyota 86. It was a hard-fought battle but Deane was too strong. 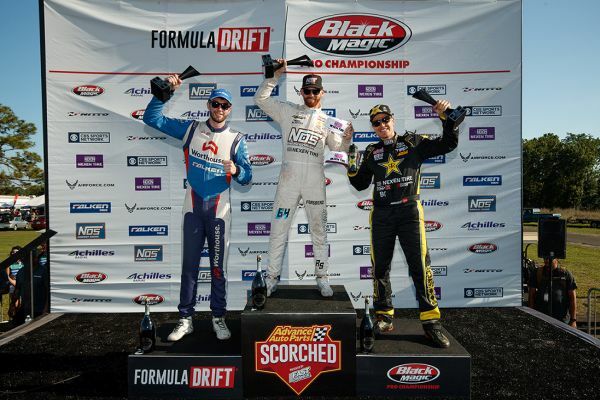 Round three in Atlanta, GA takes place on May 11-12, and Formula DRIFT president, Jim Liaw, was very happy with how things were progressing: “The south-east region is so strong for FD as the audience continues to grow.